As per article 366(12A), GST or Goods and service tax is an indirect tax in India which is levied on supply of goods or services or both except on the supply of alcohol for human consumption.The purpose of GST is to incorporate multiple indirect taxes that were getting charged from suppliers and consumers by the Central and State government. 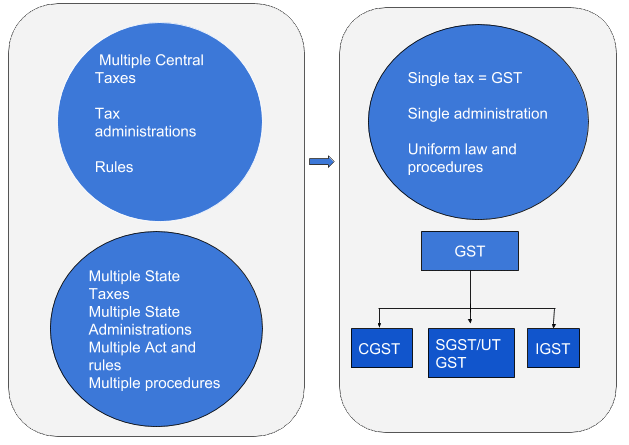 Though Goods and Service tax law have been introduced with some unique principles but it also consists of some important components of old Central and State tax laws.It is also influenced by VAT/GST legislations of several countries like European Union,Australia and Malaysia etc in addition to International guidelines of OECD. The Indirect taxes which were getting charged by the Central Government until 1 July 2017 are Central Excise duty,duties of excise imposed Medicinal and Toilet Preparation Act, additional duties of excise,service tax,Central surcharges and cesses,additional duties of customs(CVD and SAD) while the state taxes which were encompassed in GST are CST,State VAT,Entertainment tax,Purchase tax,Tax on lotteries,luxury tax,state surcharges etc.The constitution has been amended to dispense the coexisting powers to Centre and state for levying GST ,where Centre will be imposing GST on sales of goods and States on the provision of services. The bill was passed by the the Rajya Sabha on 3rd of August,2016 and by Lok Sabha on 8th Of August,2016. Article 246 defines the Concurrent jurisdiction for levy and collection of GST by the centre and the states. Article 269 A specifies that Centre would be responsible for levying and collecting IGST on supplies of inter-state trade and commerce including imports. Clause 19 states compensation would be given to states if they will have loss of revenue for five years on recommendation of GSTC. On recommendation of GSTC, GST will also be levied on petroleum crude,high speed diesel,petrol,natural gas,aviation turbine fuel from a later date. The idea of GST was recommended by the tenth Prime Minister of India, Mr.Atal Bihari Vajpayee in year 2000 for which an empowering committee was formed by state finance ministers to prepare the structure of GST.The representatives from the Centre and the State were urged to study several aspects of the proposal and come up with reports on exemptions,taxation of inter-state supplies,taxation of services.The committee was headed by the Finance Minister of West Bengal, Mr.Asim Dasgupta till 2011 where Mr.Vijay Kelkar between 2002 to 2004, being an advisory to Finance Ministry led the task force for highlighting the problems in the concurrent tax structure and reporting how they can be rectified by adopting GST. In 2006,the Finance Minister Mr.P.Chidambaram proposed to subsume GST in budget with a long term objective of introducing uniform taxation structure in India after which 1st April,2010 was decided as the date on which GST would be implemented in India.But the empowered committee released first discussion paper in 2009,which became the point of discussion between centre and the states. In 2012,Congress put forth the bill for implementing GST which drew the disapproval from the other party due to concerns over clause 279B due to which finance ministers of different states held meeting with finance minister of India to resolve all the issues. In 2013 during the budget session Finance Minister declared that states will be given compensation of Rs 9000 crore as compensation, convincing state finance ministers for co-operating with the government to implement indirect tax regime. In February 2015 Arun Jaitley, the new Finance Minister declared in budget speech that GST will come in to effect by 1st,April 2016 but to difference between states and parties and other legal issues it was delayed for a year. On July 2017 four GST related bills became acts with finalised rules and rates.These were Central GST bill,Union territory GST bill,Integrated GST bill,GST bill as compensation to states. Reduction in Cascading of taxes. Reduction in multiplicity of taxes. Itâ€™s an effective tool to determine the tax value applicable to commodity and services and to calculate the value of product and services. Drafting of GST rules and procedures-CGST,UTGST and IGST laws. It is responsible for the administration of IGST and CGST laws. Levy and collection of custom duties. Training of officials of both Centre and states. Assessment ,anti-evasion and enforcement under CGST,IGST. Provides training to centre and states.